This 1854 A. J. 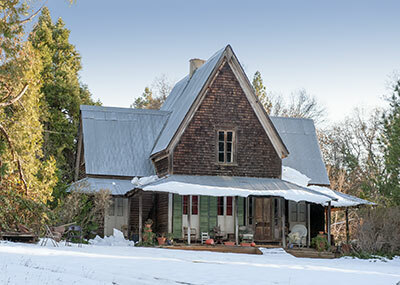 Downing designed "Carpenters Gothic" is among the earliest such wood frame structures in the state. 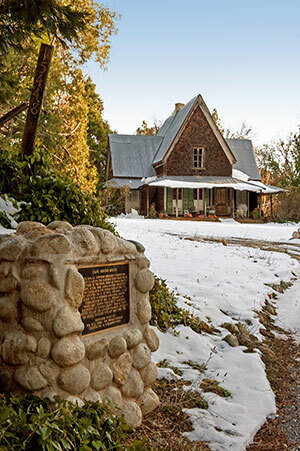 Built by Josiah Prentiss Brown, miner, 49er, local banker, multi-term state legislator and Commander of the Yuba Light Infantry, Co. E, 1st Batt., 4th Brgd. Ca. Nat. Guard with 80 members and local armory. Commissioned by Gen. J. C. Fremont and "familiarly known throughout Northern California as Captain Brown", with 20 years service became the longest standing officer in the Guard. Initiated into ECV May 19th, 1856. Dedicated 10/10/10 by Wm. Bull Meek - Wm. Morris Stewart Chapter No. 10, E Clampus Vitus.